Eleanor, Henry III’s youngest sister, was born some time in 1215-16 when Henry was around eight years old. In October 1216 the children’s father, King John, died, leaving nine year old Henry of Winchester to become king. The royal siblings were raised in separate households and rarely saw each other; Eleanor in the care of Peter des Roches, Bishop of Winchester, and a household that would teach her what she needed to know to become a wife, Henry with household knights and noblemen who would teach him the art of kingship. Despite this necessary separation, the two grew to enjoy a close and mutually affectionate relationship when they were young adults, before things became extraordinarily difficult later in life. This post aims to explore the relationship that Eleanor and Henry once enjoyed, as despite how things ended it wasn’t all doom and gloom between them. Often, arranged marriages are seen as upsetting or cruel for the young woman involved, though this was not always the case. Henry arranged his sister’s marriage to William Marshal jr, the son of the famous knight of the same name and Earl of Pembroke, in 1221 when Eleanor was around six years old. Rather than treating her as a mere pawn, Henry took care to ensure that this match was the good for his sister as well as himself. 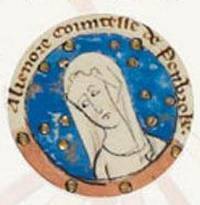 Of course the match served a dynastic purpose, as the Earl of Pembroke would allied to the royal house through the marriage, but this was important in any royal marriage in the thirteenth century. Eleanor married and became a countess in 1224 when she was nine, and Henry delayed consummation for a further five years, which could be argued as Henry and Marshal both showing concern for his Eleanor’s welfare. In 1229, when the marriage was most likely to have been consummated, Henry granted Eleanor and Marshal ten manors that would remain in Eleanor’s custody in the event of her widowhood, ensuring that she would have stability and an income if the worst should happen. Eleanor was given a governess, Cecily of Sandford, who she became very close to, and there is nothing to suggest she was unhappy or distressed with the marriage Henry had arranged. When Eleanor did become a widow in April 1231 Henry, it appears, tried very hard to ensure his sister had an income and a comfortable life. She was entitled to the manors granted by the king in 1229, plus a third of her late husband’s Marshal lordships. The two successive Earls of Pembroke, Richard and Gilbert Marshal (William jr’s brothers) both agreed to pay Eleanor a cash sum rather than give up their lands. Both men, however, frequently defaulted on the payments. Henry seems to have not wanted his sister to struggle and paid her cash dower himself on several occasions. He also granted her the manor of Bosham in Sussex in January 1234 and sent her many gifts of venison from his forests in Havering, Chute, Salsey and others; she received more than 50 deer in total during this time. These displays of generosity from the king to his sister demonstrate his love for her, his concern for her well being, and perhaps gives us a clue that their relationship was a close one, personally. When Eleanor broke her vow of chastity in 1238, she again enjoyed her brother’s support, despite any initial problems. Henry was present at his sister’s second wedding when she married Simon de Montfort; the ceremony took place in the king’s chapel within the Palace of Westminster and a mass was celebrated afterwards. These ceremonies again demonstrate just how close these two siblings were. Henry showed sympathy for what was, and still is, widely regarded as a love match between Eleanor and Simon; he gave his approval to the match between his sister and a man who was, at the time, socially beneath her; he kept their secret, he granted Simon the Earldom of Leicester and later defended their marriage when his barons, which included his brother Richard of Cornwall, showed their discontent. As Eleanor had taken a vow of chastity Simon was required to travel to Rome and gain a dispensation for his marriage from the Pope, while he was away Henry established his sister at the royal castle of Kenilworth as she had very quickly fallen pregnant. Simon returned from Rome in mid-October 1238 and arrived at Kenilworth castle in time for the birth of his son, who was christened Henry. King Henry travelled to Kenilworth to visit his sister following her safe delivery, and that Christmas sent her a robe and surcoat of cloth of gold and gold baudekyn as well as a fine quilt, mattress and coverlet of scarlet cloth and fur. Their relationship, as we can see, was strong and the King thought very highly of his sister and her new husband. The closeness and familiarity between Henry and Eleanor suffered its first real challenge during the summer of 1239. The Queen had recently delivered a son, Edward, and just before her churching ceremony Henry discovered Simon had used his name as surety on a loan without his permission. Henry was furious and raged at his brother in law; he accused him of both using his name without permission and of seducing his sister before the two were married, which had meant Henry had had no choice but to allow the marriage. The second accusation was unfounded; there was no gossip at court about the Montforts and no chroniclers mention any sexual scandal, so this seems to be an act of spite on Henry’s part. The Montforts spent the next few years mostly in exile, away from Henry and his court. It was with the help of Beatrice, the Countess of Provence and Henry’s mother in law, that relations between Henry and his sister were healed in the early 1240s. Henry pardoned the couple’s debts to the value of £1,000, gave Eleanor a dowry to the value of 500 marks, and sought out Eleanor’s dower payments owed to her by the Marshals. Simon was also appointed guardian of Kenilworth castle at this time, increasing his income and status. At this time in his life, Simon was supportive of the king and his policies and the two men got on well. The upset of the recent past seemed to have been forgotten. Kenilworth castle has become known as Montfort’s castle over the years, but for a long time it wasn’t his. In 1238 Eleanor stayed there while she was pregnant and recovered from childbirth, though at this time the castle was still Henry’s and it was he who was financing the repairs that were taking place. Entries on the Close Rolls tell us that Henry granted bream from the fishponds there to the Bishop of Worcester in March 1238, and oak trees from the forest in the castle grounds in September 1238 to Geoffrey de Langley, ordering his constable to make sure these gifts were granted. In fact, Kenilworth did not belong to the Montforts until 1248, when it was granted to Eleanor for life. King Henry appointed castellans between 1238 and 1244 until he gave custody of the castle to Simon; this was, it seems, a grant that confirmed the new peace between the king and his sister- their relationship was restored to its former closeness. The Montforts were still enjoying a good relationship with the king in 1253 when the castle was granted to them both that November. Simon developed the castle’s defences once it became his own, completing work started by King John, his wife’s father. Another five years went by before the Montforts and the King became enemies rather than allies, and during this time it is, I think, safe to assume the close relationship they had enjoyed up until now continued on, for the most part. Henry III and Eleanor’s relationship ended quite badly, all things considered; Eleanor’s husband and one of her sons were killed at the battle of Evesham in August 1265 after years of political upheaval between king and barons, and following months of further struggle after the battle and a siege of Kenilworth she and her surviving family ended Henry’s reign exiled on the continent. Eleanor died at the Dominican nunnery of Montargis – an order founded by her husband Simon’s sister, Amicia – in April 1275. It would be very easy to judge Henry and Eleanor’s entire relationship by the way it ended, as we do with so many historical partnerships – Edward II & Isabella of France, Richard II & Henry Bolingbroke, or Henry II & Eleanor of Aquitaine to name but a few – but this would be a big mistake. Henry’s relationship with his sister, like most relationships, was much more complex than this. Only by looking at their entire relationship we can begin to understand just how much, at one time, they meant to each other.